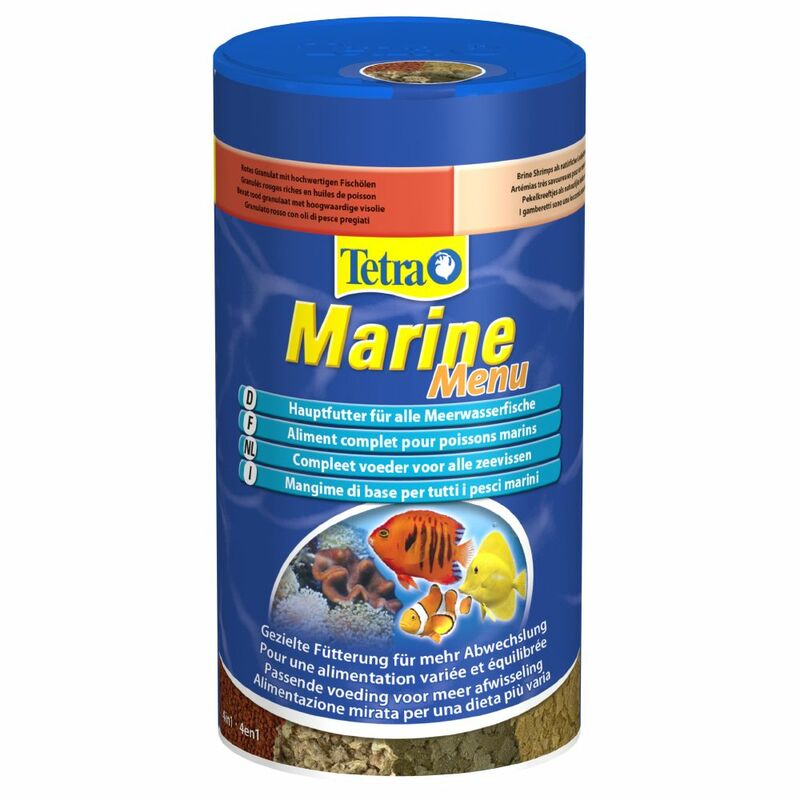 Tetra Marine Menu is a complete food in flaked form, suitable for all kinds of marine fish for a healthy and balanced diet. Made with a mixture of four different types of food, it is specially adapted to the needs of marine fish and provides a variety of flavours and tastes to keep your fish interested. In their natural habitat, marine fish feed on a variety of plants and animals to ensure they receive the neceΒary nutrients and vitamins. Tetra Marine Menu is based on the natural diet of marine fish and is designed to provide for all their dietary requirements. The composition is made with four specially developed foods that optimally cover the dietary requirements of marine fish. The green flakes contain spirulina algae and the yellow flakes are fortified with vitamins that promote food health. The red granules contain a high composition of high-quality fish oils and the last component, for an extra treat, are brine shrimp, which are guaranteed to make this food a hit with your fish Tetra Marine Menu at a glance: Complete food for all marine fish Mixed flake composition, made with four specialised food types Ideal for a healthy and balanced diet Green flakes contain healthy, mineral-rich spirulina algae Yellow flakes contain vitamins to promote the overall health of your fish Red granules contain high-quality fish oils Contains brine shrimps, as a special treat With special BioActive formula for a long and healthy life.